The award ceremony took place in the Marble Hall of the Federal Ministry of Science, Research and Economy. The criteria for the award of this quality label were developed in the framework of the EQAMOB project, which was carried out by the Europe-wide EuroApprenticeship network. They include, among other things, aspects of organising and preparing internships abroad, providing support during their stay, as well as evaluating and recognising internships as part of apprenticeship training. The award was presented this year for the first time in Austria. 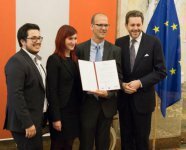 The contact point for the awarding of the quality label in Austria is the IFA - Association for International Exchange of qualified workers.